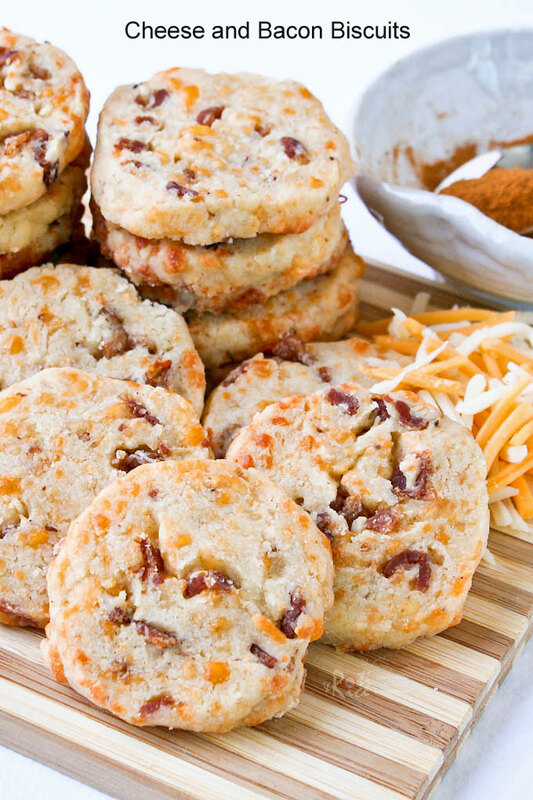 These Savory Cheese and Bacon Biscuits are a tasty alternative to crackers for snack time. Recipe includes traditional and gluten free options. Time is just flying by and Christmas is less than three weeks away! I have got to start baking as everyone loves treats for the holidays. Each year I make a variety of goodies for the season in addition to our favorite Rich Fruit Cake. Please click on the picture to get to the recipe. This time round, I am going to start with these savory Cheese and Bacon Biscuits. Ro-Jiro (second son) loves these savory treats but he thinks they should be called a biscuit. I have no problems calling it a cookie…why not? 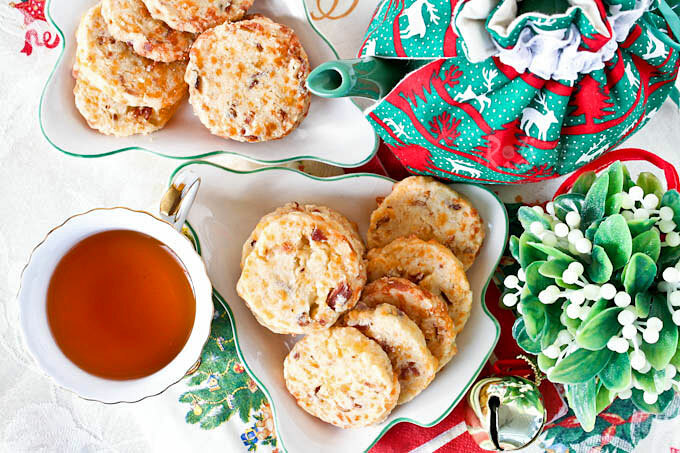 Savory cookies for Christmas breakfast sounds really good to me! I made two batches using basically the same ingredients but with different flours. The first batch uses all-purpose flour while the second uses a gluten-free flour mix. I added some sorghum flour and garbanzo bean flour to the mix to give the cookies a firmer structure. I must say that I am very happy with the results. The step-by-step here shows the traditional all-purpose flour version. Combine all-purpose flour, baking powder, salt, and cayenne pepper in a large bowl. Mix well. Rub in butter, shredded cheese, and bacon. Mix in milk to form a soft dough. Shape into 2 logs about 1½ inches in diameter. Wrap with plastic and refrigerate for 30 minutes. Pre-heat oven to 375°F (190°C). Slice dough logs into ¼-inch thick slices. Place on lightly greased baking sheet and bake for 15 minutes or until golden brown. 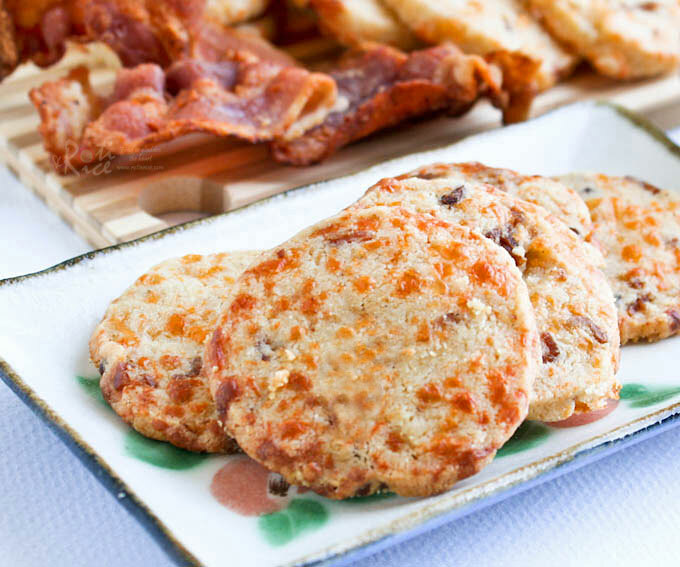 These are the gluten-free Cheese and Bacon Biscuits. They are slightly flatter but still hold their shape. They also have a nice cookie texture that is not crumbly. Combine GF flour mix, guar gum, baking powder, salt, and cayenne pepper in a large bowl. Mix well. Rub in butter, shredded cheese, and bacon. Mix in milk to form a soft dough. Shape into 2 logs about 1½ inches in diameter. Wrap with plastic and refrigerate for 30 minutes. Pre-heat oven to 375°F (190°C). Slice dough logs into ¼-inch thick slices. Place on lightly greased baking sheet and bake for 15 minutes or until golden brown. Cool on wire rack. Combine all ingredients in a large bowl. Mix well. Store in air tight container. Don’t worry and just enjoy your vacation. Everything will eventually fall into place. I can’t believe Christmas is almost upon us! You have made some really delicious treats I see…the biscuits look scrumptious, lovely photos! Can’t go wrong with cheese and bacon! I love savory cookies like those, Biren! So perfect for the holidays! I love your savory biscuits! Can I eat that for lunch…? =P You make lots of goodies for the holidays. No wonder you are busy. Even I’m not a baker (or I should now say I’m a beginner baker) I’m already so busy, I can’t imagine a lot of baker who actually bake and do all the other stuff for the holidays. Amazing. Your fruit cake looks so good! I LOOOOVE fruit cake…. 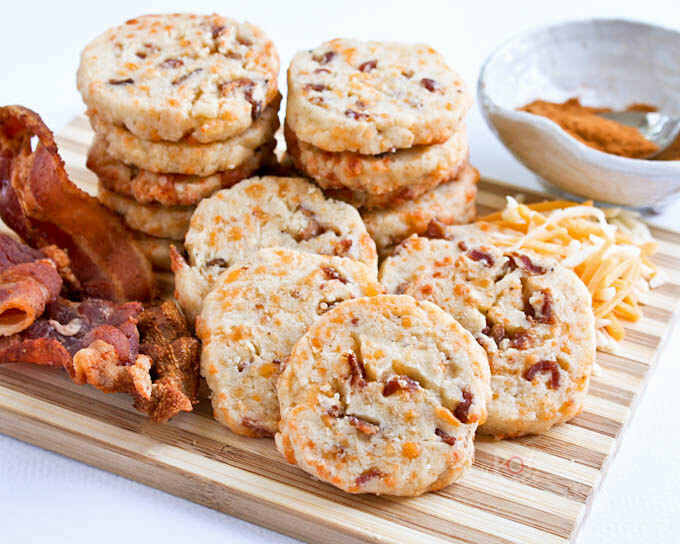 I love savory biscuits too and this cheese and bacon biscuits look so yummy. So good to serve these for the holidays. 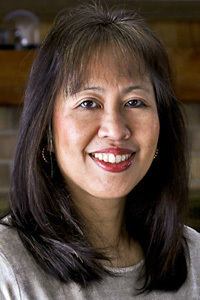 Thanks Ann! It is good to have something savory in the midst of all the sweet stuff. Yum! I love savory biscuits/cookies and these look amazing. So impressed that you made two versions! Both look awesome. Thanks Katherine! I did not want to leave my eldest son out. He is a happy camper as I will be making more GF cookies with the 4 cups of GF flour mix that I have concocted. I am very happy with it as they seem to work really well. These are great for a small party, savory . thanks for sharing. I need to try these soon!! Love your recipe!Great for the holidays! I am imagining eating this biscuits with the flavors of bacon on it. My goodness, Biren this is a yummy. Have a good weekend! These look absolutely scrumptious yummy savory treats! What a savory and tasty little biscuit! I can see these being served with a nice winter soup. Thanks for sharing another great recipe! oh yes, savoury cookies..and those are even better with bacon bits and cheese! I love savory and think these sound wonderful. Love all your Christmas dishes and napkins. I need to get into the spirit. So glad to hear you enjoyed the cookies! Yes, definitely spice it up. I kept it relatively mild because my son has a very mild palate. Adding rice cereals is a great idea. I will have to try that the next time. You managed to put everything good in those biscuits! Good job! These savory biscuits with the lovely bacon and cheddar would surely put a smile on everyone’s face not just for the holidays, but all year round. Thanks for sharing all your other wonderful recipes from last year, as well! Have not made fruit cake for ages, at least 20 years…that is a long time. Beautiful fruit cake, as well! I love savoury biscuits like this!